“Growing and monetizing a blog starts with amazing content that’s not about you,” explained Todorovich. If you’re not considering the needs and wants of your audience, you won’t keep them coming back, much less be able to monetize the traffic. Providing content that’s “interesting, valuable, and useful above all else,” is a must, and requires content marketers to know and listen to their audience. Todorovich urges content marketers to use data to define their audience. “Make them as real as possible to your team. Give them a name. Give them a picture. What are their problems? 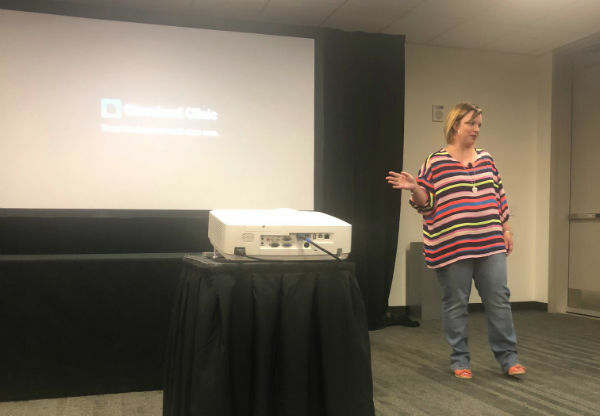 How can you make decisions easier for them?” This important concept ran deep at #CMWorld this year, and jibes especially well with with the “Doris” call-out from Ann Handley’s keynote. And no wonder the know-your-audience theme resonated; Once you you’ve made data-informed decisions about what your audience wants and can think of them as individuals with real questions, you’ll know what content will resonate with your readers and keep them coming back. By letting the audience inform the content strategy, Todorovich grew the Health Essentials blog from two hundred fifty thousand views per month to one million per month in just half a year after joining the team. To protect the brand and address the specific needs of the Cleveland Clinic (and it’s PR and legal departments), Todorovich and her team wrote a disclaimer that is shown on every ad unit on their site. It informs the reader that the ad supports the mission of the Cleveland Clinic, and links to the full, often-updated advertising policy. Sure, the policy limits the potential of advertisers—the clinic doesn’t accept advertising from alcohol or tobacco companies, for example—but creating it was necessary in order to navigate the landscape of the healthcare industry and continue to grow trust from their readers. The same knowledge of the hospital’s internal landscape is what led Todorovich to engage a partner to help manage the advertising rather than take it on herself. In a 50/50 revenue share partnership, Todorovich and her team provide the content while their partner manages and sells all of the advertising. Both companies allow the other to focus on strengths without pushing comfort boundaries. While content marketers may not all face the same obstacles, the emphasis that Todorovich put on the need to remain flexible enough to navigate circumstances without sacrificing the integrity of the content or brand was well-received. The first advertisements that were sold on the Health Essentials blog were “just traditional display” ads, said Todorovich. “We did do a small test in google, because we feared there would be a negative reaction.” But, the audience didn’t mind the advertisements on the Health Essentials blog “probably because our content is mostly news-driven. In fact, the advertisements may have even given us more credibility as a news source,” explained Todorovich. Strategies, of course, will vary based on industry, subject matter, objectives, and other factors in the marketing equation. What’s worked for the Health Essentials blog team is to huddle every day to ask and answer two questions: “What did we learn yesterday? And, what are we testing today?” Certainly two questions that would be helpful for any content marketing team to ask, especially as they begin to dabble in monetizing a blog.